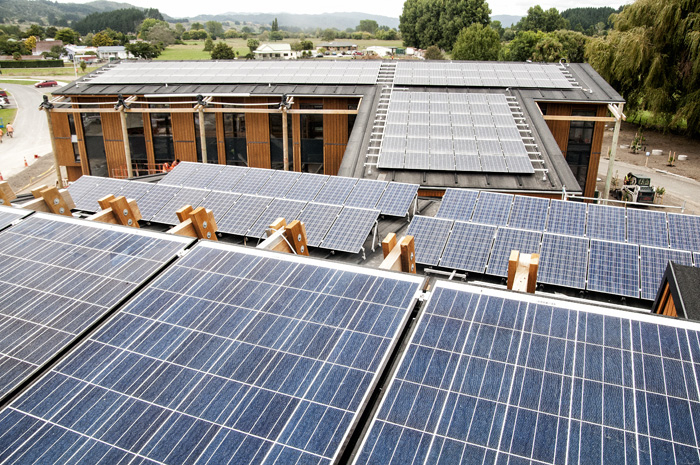 Tāneātua like many parts of Te Urewera is blessed with an abundance of potential solar energy. The location of Te Uru Taumatua takes maximum advantage of the sunlight on the site with one of this countries largest array of photo-voltaic panels (solar panels, PV panels) resting upon the roof. Te Uru Taumatua makes its own power through these panels converting energy from the sun into direct current electricity. Selective and disciplined use within the complex means that we live and operate within our means and any surplus power can be sold back to the national grid. The effect of this is a Net Zero energy.